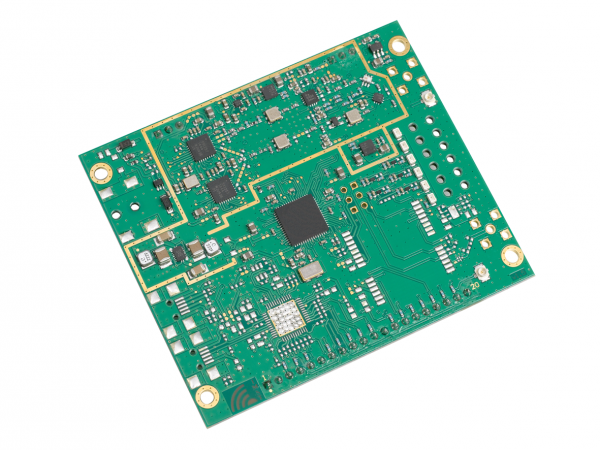 Product information "iC880A-SPI - LoRaWAN Concentrator 868 MHz"
The iC880A-SPI is able to receive packets of different end devices send with different spreading factors on up to 8 channels in parallel. Due to the fact that the combination of spreading factors and signal bandwidths results in different data rates the use of “Dynamic Data-Rate Adaption” becomes possible. That means that LoRa® nodes with high distances from the concentrator must use higher spreading factors and therefore have a lower data rate. LoRa-nodes which are closer to the concentrator can use lower spreading factors and therefore can increase their data rate. This allows to build easy to handle star or multiple star networks without the need of routers or repeaters. More information, such as data-sheets, can be found here. LoRaWAN™ is a trademark of LoRa Alliance™, LoRa® is a registered trademark of Semtech. Microsoft Windows®, Microsoft CE® are registered trademarks of Microsoft. Related links to "iC880A-SPI - LoRaWAN Concentrator 868 MHz"
Customer evaluation for "iC880A-SPI - LoRaWAN Concentrator 868 MHz"